We got to work on sketching. I immediately thought of Frida's body cast--she was in a horrific bus accident in her teens, which resulted in massive injuries (including a broken spinal column) and necessitated 35 surgeries over the course of her life to correct. She began painting while she was bed-ridden, and later would paint her body casts, using a mirror to help her. I saw one of her casts in person at the Casa Azul in Mexico City, and it looked like a strapless bustier to me. I also thought of skeletons--Frida's broken bones and Day of the Dead sugar skulls--and a skeletal structure became integral to the design. After sketching, we were given $100 to shop for supplies on the expo floor. Here I am picking out some felted wool rayon at Crawford Designs. I also bought fabric at Haberman and Sew Batik, and a couple gorgeous trims from Soutache. The bustier was made in navy cotton, and I used ivory petersham ribbon on the outside as external casings for spiral steel boning. I arranged the ribbon in a subtle ribcage design and adorned it with bows, because Frida was nothing if not feminine. The back is similar, without the bows. There is vertical and horizonal boning, creating a cage effect. The skirt is batik, as Frida loved folk art. There's horsehair in the hem (of course!) and border-print ruffles peeking out from below. The capelet is in a saffron-colored felted wool/rayon, and it elongated Samia's neck in the way Frida's portraits often did (you can check out some portraits here if you're interested. My favorite is "Broken Column."). The final touch was a bright rose-red silk ribbon which was twisted through Samia's hair. I draped all three garment patterns, which felt like a big accomplishment. We had to sew everything over Friday and Saturday (in the middle of the expo floor, no less), ending at 3pm to get ready for the big runway show. We were interviewed by the judges first (one of them was Suede from Project Runway Season 5), and it was hard. I was nervous. We followed that up with the runway show, where we got to talk about our inspiration for the garments. Samia looked stunning. 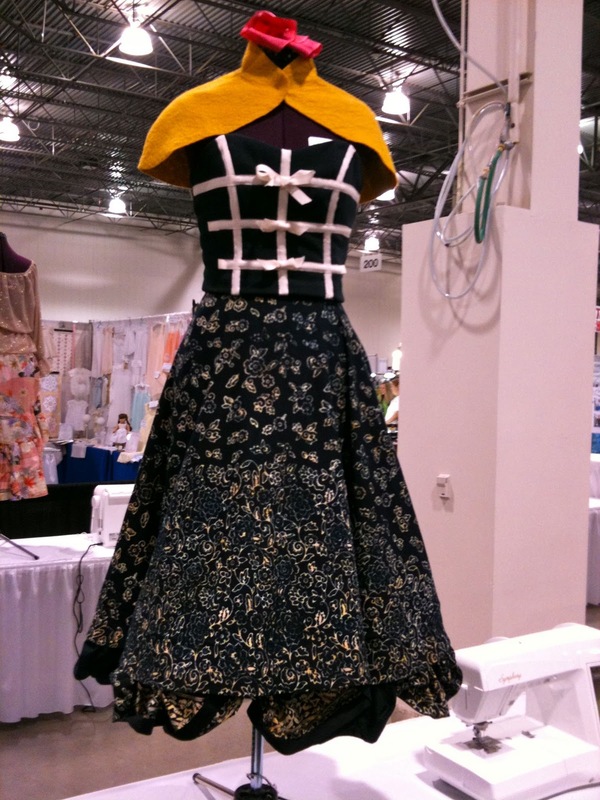 After all the garments were presented, they announced the top six and I made it! We were interviewed by the judges and some audience members while onstage (I felt like I was in a pageant). We made our way backstage while the judges deliberated. We came back out and the winners were announced, starting with third place. It was me! Hurrah! I won a Babylock Melody sewing machine. Here are the winning garments. The center is First Place (inspired by Alice in Wonderland) and on the right is Second Place (inspired by 101 Dalmatians). Overall, it was a fantastic experience. Everyone was super nice (no reality show back-stabbing) and it got me thinking outside of my usual design choices. The sewing wasn't as stressful as I anticipated; the hard part was the designing. I think I'll have more to write about that later--as well as my recap of the expo itself, of course. I have the garments home with me, so I can show you more construction details if you're interested. Just don't ask to see how the ruffles are attached--that was the one time crunch! (Don't worry, it's not glue or staples.) It's just not very pretty . . . and of course everyone at the reception afterwards wanted to flip up her hem and inspect it. Oy. Anyway, more to come! Oooh! I LOVE Friday, and the dress you designed is perfect for the inspiration. Love that you were inspired by her broken spinal column, but created such a beautiful garment from it. What a stunning design, Gertie! I absolutely LOVE every single part of it! I think it is a gorgeous silhouette, really impactful overall, and your model is SO beautiful, too! Gosh, I'm gushing but it is all very deserved. GREAT JOB and Congratulations on your prize! Congratulations!! I love the little capelet, and the bustier, and the skirt! Really well done on coming third. It must seem insane that what started out as a blog to keep yourself busy has turned into all this! Congrats on third place! That's amazing! You really captured Frida's essence and I absolutely love the saffron capelet, it really finishes the outfit!! Great job!!! Can't wait to hear more about the Expo! Congrats! You ensemble is lovely! I just adore the color you choose for the caplet! Congratulations! I'm not bias or anything, but I think your design was head & shoulders above the other two! Gorgeous - and so much meaning in your design - congratulations! It is so Frida and so beautiful. Yipee!!! You go girl! That's so awesome! I was checking all weekend to see if you posted anything about the Passion for Fashion! I finished my bombshell dress- Thanks to all your instructions! Just when I think I can't possibly have a bigger crush on you, you post this loveliness! We have an entire wall of our apartment set up as a sort of Frida/Dia de los Muertos gallery. My daughters (they're six and three) get excited when we're out somewhere and happen to see a Frida. They think of her as part of our family. Congratulations on your win! And you're right, your gorgeous model could not possibly have been more perfect. Absolutely beautiful. The dress captures all those aspects of Frida's life, and the model was lovely in her own right, as well as personifying that powerful and interesting woman. If you want a very unusual and entertaining perspective on Frida and Diego, you must read The Lacuna by Barbara Kingsolver. I look forward to hearing more about the Expo! Congratulations, Gertie. What a great dress! I LOVE FRIDA!! I just caught the end of the Salma Hayek movie today AND checked out Frida Kahlo Portrait of a Mexican American Artist from the library (again) then I see this post. Frida is still everywhere! Congrats on your 3rd place win!! I hope you make good use of your prize. You should have won! That's all I can say. Congratulations on your 3rd place award but I think it should have been 1st place! I totally don't get the Alice in Wonderland win. Anyway, fabulous entry of Frida and her life. Girl, you are a rising star! I tend to agree with the last poster - maybe I'm biased but I love your outfit! And, how stressful!!!!! Congratulations! I went to my first ASG conference in LA and now I'm in love with the organization - I seriously can't believe the high skill levels! What I like about this design is that you stayed very true to your point of view. Well done Gertie. Enjoy your prize. You fabulous, fabulous girl! Way to go. I'm proud to know you and so happy for you. 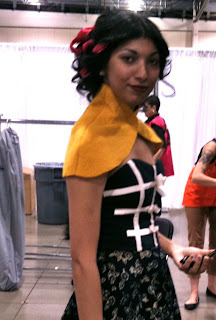 Your design was a perfect ensemble for Frida and yet so true to your "Gertie" style. Congratulations!!! With your talent and the great inspiration that is Frida Kahlo there would be little doubt a fantastic dress would be done. It's gorgeous (and my favourite of the three)! I am very proud of you and I must say that I like your creation the best. Excellent job, and congrats on the win (although I agree, it should have been 1st)! It was great to meet you for about 10 seconds on Saturday; I also kept checking in to see what you had to say. Hope you come to the Expo next year! Congratulations! It sounds like a fun time. 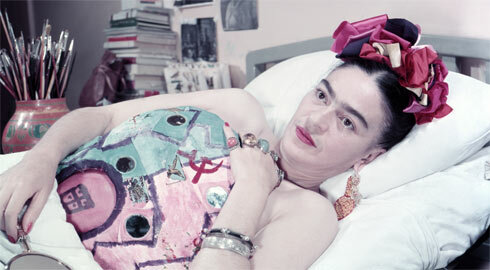 Love all of it, Frida (and one of my fav's) and you really did capture her spirit. Did they just pull a season 8? Because I think your garment should have won first place. Congratulations! I love how well your dress matches the inspiration but stays out of being a costume. Wow!! 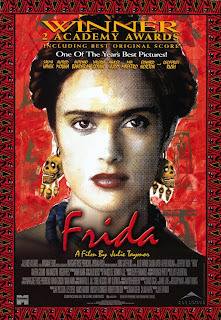 I love your design, I love the inspiration, I love the story (no one else wanted Frida anyhow). So fantastic. Congratulations on your win and count me as another person who totally prefers your outfit to the other two (they're lovely but no wonder if I'm here reading it's because I especially dig your style). Not to be biased or anything, but I loved your design most of all =) The bustier really reflects the ribcage inspiration - bravissima! Great design, it really have that "Frida" style in it, it is not a surprise you had a prize! Great submission to the contest. Very very reflective of Kahlo. I'd seen a Kahlo exhibit a few years ago at the Philladelphia Art Museum and your dress is very reflective of her self portraits and her other collected works. Good job! Congrats! Your star is soaring right now, Gertie! Congrats on third place and your prize! How exciting. From where I sit, yours was the best design, but what the hell do I know! congrats ! i LOVE this Frida Kahlo is my favorite artist! an amazing design. Congratulations! I agree with many others, you should have won, or even 2nd. But, hey, you placed!!! I, for one, am looking forward to any construction and designing info you choose to share with us (especially how the ruffle is attached -- even if it IS messy). It's the details that really set garments apart. Congrats on scoring so high in the contest! It's a lovely design, and though I haven't seen the movie, I can definitely see the inspiration from the pictures you posted and from what knowledge I have of her paintings. FRIDA!! I love her so! And I LOVE what you did! Can't wait to hear more about it. And congratulations! Gertie, love your design, you did great! Can not wait to meet you in November while taking the heather Ross weekend workshop! It was fun to meet you and see your work in person! Such a fun show! Great job! From where I sit, your design and execution was more difficult than the two that placed higher, lovely work. Congratulations! It must hve been very exciing indeed. 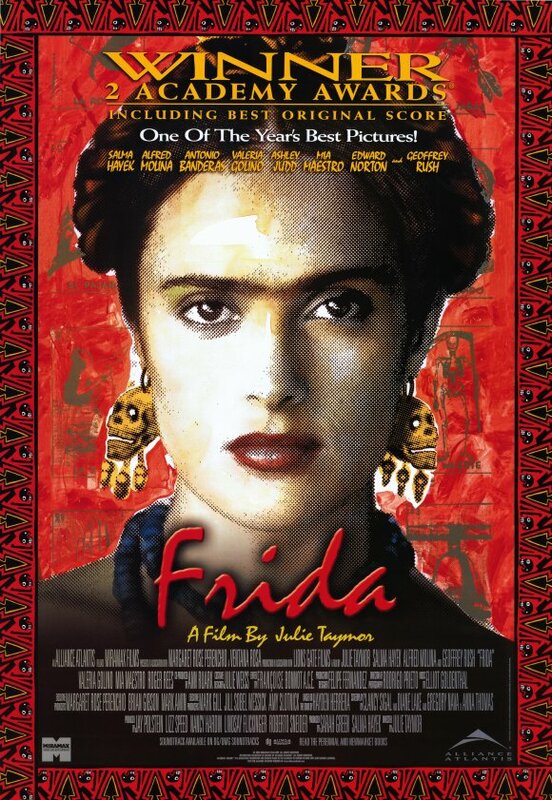 Frida is a favorite of my daughter's and mine. Your garment is incredible. yours is lovely! and you can definitely figure out that it is Frida inspired. What a wonderful dress you made! congratulations. Designing something so quickly must have been nerve-wrecking. Love the skirt...would be great to get some construction details. Enjoy the prize. Absolutly stunning. Congratulation. And I feel like Samina, not biased either, but I think your creation should have been voted for first place. Gertie, I think you were ROBBED of the first prize!! Yours is BY FAR the best, and most sophisticated design! I am very surprised, but then I am a Frida Kahlo fan too (Have you read The Lacuna by Barbara Kingsolver? - great read) .. The only thing I would have done different is put pink bows on the bustier! I think your design is genius though and am in awe with the speed at which you accomplished the whole thing!! She's one of my fave artists as well - I'd have picked that film too :) I based my GSCE (English Exams taken at 16) final project on her and Judy Chicago. I love the bustier you made and the little capelet. 3rd place? You wuz robbed! Fabulous outfit . . . congratulations on your work! Wow! Congratulations on landing the third spot, Gertie! Yes, Samia did your Frida outfit proud, but you are the real star! BTW, I think incorporating something skeleton is *very* "fashion forward" ;-) And the capelet has definitely plastercaster allure - it looks practically moulded (hope I spelled that right...) on Samia's shoulders! HAVE to chime in, and I don't comment much--you really should have won. The other two are nice--but yours clearly comes on top in creativity, relationship to the theme, construction--and, I think, wearablity. Congrats on your win, and your dress is clearly on top. Wow, wow, wow! So amazing! It sounds like it was such a fun challenge! Can't wait to hear more about it!! I love Frida and the Frida dress. I think you deserved first place! The dress fits Frida's story so well. To my eye, your dress deserved first place! It's really interesting reading about your process under stress, and I love it that you brought in so many elements from your knowledge of Frida's personal life and art. I liked yours the best. How exciting! I am grateful to hear your account of the action! Love your garment(s)---- fabulous! I was watching you make the outfit both days, and I've got to say...it was fantastic!!! I wish everyone here could have seen it in person.